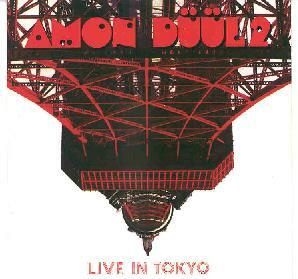 Amon Düül II - "Live in Tokyo"
Vocalist Renate Knaup shouts 'Wake Up!' as legendary German 'kosmische' artists Amon Düül II start into the title track from their 1995 reunion CD, Nada Moonshine #. I assume that statement is autobiographical as the band has just woken up' from a twenty-year hiatus, if you ignore the various other permutations of Amon Dhhl (with and without the numerical designation) that persisted through the late 70's and 80's. While those groups featured (at most) one member of the original band, this newest reincarnation consists of core members Chris Karrer (guitar, sax, violin, vocals), Lothar Meid (bass, vocals, keyboards), and Knaup. Drummer Peter Leopold, while part of the band on the new studio recordings, was apparently unable to make the trip to Japan, replaced by the appropriately-named Wolf Wolff. Artist and part-time keyboardist Falk U. Rogner was responsible for the light show and cover art (oddly, an inverted image of the Eiffel Tower). The 70-minute live set presented here is a fine one, although they left off several classic tracks ('What You Gonna Do?' from Utopia, and Yeti's 'Eye Shaking King') from the performance, presumably because of to time limitations. The recording quality and especially the mix are suspect in places, with the vocals often being too prominent; usually the reverse is true. The band's performance is also very hit-and-miss, with some of the more intricate tracks sounding quite uneven. You might expect that with a group whose music is so innovative, and you have to remember how long it has been since they've performed together. They're a little rusty. This recording has a 'rehearsal' quality, which I will forgive them for now. As such, this is something that is interesting mainly to the most loyal fans of AD2 (like myself), and can bide me over until more new recordings appear on the horizon. New fans should go back and find 1972's Wolf City and then Nada Moonshine # to get a 'then and now' perspective.